At the meeting, I argued that securing additional resources for UHC would require member countries to implement challenging revenue-enhancing and expenditure-rationalizing measures. Fortunately, the policies needed to achieve UHC are likely to be phased in over time, suggesting the additional resources to fund those policies would only be required over time. The median health spending in the Eastern Mediterranean is 2.7 percent of GDP, with Jordan spending twice as much as Afghanistan, Pakistan, and Yemen (see figure 1). As a share of total budget outlays, the median allocation for health in these countries is around 9 percent. In three countries—Djibouti, Iran, and Tunisia—health receives almost twice as much in budget allocations. 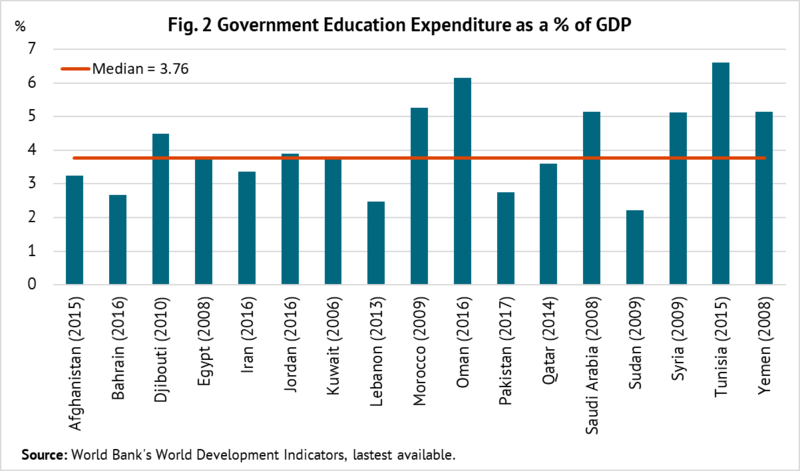 By contrast, the median spending on education is 3.8 percent of GDP, almost one percentage point more than health (see figure 2). Education receives a higher priority in budget allocations than health, with the median share of 12.6 percent, three percentage points higher than health. Evidence from advanced economies indicates that public health spending has a bigger impact on income distribution than public education spending. A noteworthy feature of the structure of health expenditures in the region is that almost 50 percent of total spending is out-of-pocket—which is higher than in Africa—and this share has remained stable in the past 15 years. Fiscal space—which is country-specific—is defined by the IMF as a government’s ability to raise spending or lower taxes without endangering market access and debt sustainability. There is enormous variation in the level of public spending across countries, but median spending in the region is 30.8 percent of GDP—relatively high compared to the average of emerging market economies. This suggests that the scope for expanding health spending for financing UHC is constrained in most cases. The recent work carried out at WHO under the auspices of Disease Control Priorities project, third edition (DCP3) shows a high degree of overlap between primary health care and UHC. All but 20 of DCP3’s 218 priority interventions can be delivered by a primary health care platform. In that case, why not finance the package of highest priority in primary health care and expand it as fiscal space grows? There is scope to enhance efficiency of health spending in the region. The most inefficient countries could potentially gain many years in (health-adjusted) life expectancy, or witness improvements in other health indicators, by using their existing allocations as productively as the most efficient countries. Energy subsidies in oil-exporting countries in the region have tended to be higher than spending on health and education. These countries accounted for the bulk of global energy subsidies in 2015, narrowly defined—equaling $94 billion or about 5.5 percent of their GDP. A gradual reduction of these subsidies while protecting low-income groups would generate fiscal space for UHC. And taxing fossil fuels further offers other benefits because their consumption generates externalities in form of congestion and pollution. Many countries in the region spend significantly more on public employment than their global peers, reflecting high wage levels compared to the private sector and/or high levels of public employment. For example, Iraq spends more than 12 percent of GDP on public employment. Improving efficiency of public investment spending is another potential source of savings. Emerging economies (including countries in the region) lose roughly one-third of public investment because of poor project appraisal, selection, and management, as well as weak management of public-private partnerships. On the revenue side, there is scope for reforming income taxes. At present, either personal income taxes are not sufficiently progressive or they don’t exist and non-wage earnings (such as investment income) are not taxed. There is room to reform tax systems to generate additional revenues from corporations, domestic and foreign. Typically, oil-rich countries only tax foreign companies. And in most countries, corporate entities are granted generous tax exemptions in a nontransparent way. The VAT yield in the region can be augmented by minimizing its multiple rates and exemptions. There are few countries that still do not have the VAT. Finally, there is scope for raising specific excises on tobacco—the median revenue take is under 0.5 percent of GDP. In a similar vein, countries could consider raising excises on sugar-sweetened beverages in light of recent positive experience in Mexico and the UK with such taxation. These examples show that it should be possible to generate resources to fund UHC by reforming both spending and revenue policies in the region. But this will require some tough choices by policymakers. It will be a long, but ultimately passable, road ahead.